Handsewn piece by piece, handbag by handbag, R. Riveter has grown from an attic-based business to the national stage in only a few short years. 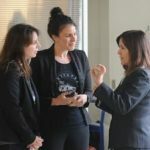 Karen Pence, the wife of Vice President Mike Pence, met with co-founders Cameron Cruse and Lisa Bradley at their “Fab Shop,” the company’s warehouse in West End, on Friday. The mother of an active duty Marine, Pence said she was inspired by R. Riveter’s business model to assist military spouses, not by offering charity but through the opportunity of a portable career. “This is not just about a job, it is about finding a career and about fulfillment,” she said. Named after the World War II icon Rosie, R. Riveter employs remote “riveters” who assemble components of the company’s handbags — often from military surplus materials — in their homes and send them to Moore County for fabrication. The bags are then sold online and in R. Riveter’s flagship store on NW Broad Street in downtown Southern Pines, and through pop-up shops. Far more than simply a catchy name on a purse, Cruse and Bradley have used R. Riveter as a successful entrepreneurial platform to inspire and empower other military wives. In February 2016, R. Riveter was featured on the ABC reality program “Shark Tank,” where they landed a substantial investment and new partner in the form of billionaire Mark Cuban, owner of the NBA’s Dallas Mavericks, film distributor Magnolia Pictures and various other interests. The show exposed their already prosperous small business to a viewership in the millions, and launched their product line into the national consciousness. Today R. Riveter employs 31 remote riveters — 100 percent are military spouses — and another 30 people at its Fab Shop, retail store, and in administrative roles. Most of its handbags are touched by at least eight riveters through the manufacturing process, with many of the individual purse components stamped with the riveter’s corresponding number. The work is slow and deliberate, despite the rapid expansion of the business. On the Fab Shop floor, the original industrial sewing machine that Cruse and Bradley purchased for their start-up business is still in use. Bradley likened their process to the work of the original “Rosies” who worked in factories and shipyards during World War II. “Every rivet had a purpose but you did not have the full effect until it all came together,” she said. “Keeping jobs, finding jobs, and (professional) licensing,” she said. Pence was accompanied by U.S. Rep. Richard Hudson, whose district encompasses both Fort Bragg and extends to Moore County. “I learned early on the challenges that military spouses face,” he said. Hudson thanked Pence for her focus on military spouses needs and said he is already seeing progress. Specifically he spoke of streamlining a process that would make it easier for military spouses on the move to retain their professional licensing and certifications, and also a significant military pay raise that was included in the most recent defense budget. “The last thing that is cut in a military budget is bullets, which means the first thing that is cut is families,” he said, expressing appreciation to the Trump administration for its work to increase military funding. Pence said it is because of company’s like R. Riveter that military spouses can find meaningful employment. Copyright ©2017 Partners in Progress | Online Development by Tangram Media Inc.